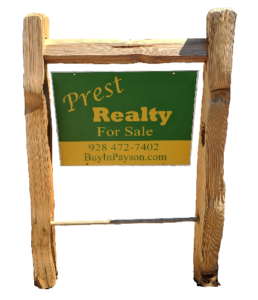 Rentals are still hard to find in the Payson area. 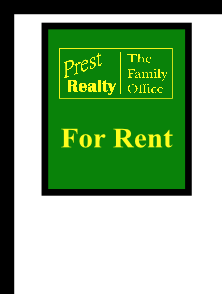 Last month Prest Realty saw 4 rentals come available with 3 rented within a week of posting. We currently have 1 available at 507 S. Ponderosa Unit B (1 bedroom, 1 bath) and 1 coming soon at 202 S. Goodnow (3 bedroom, 2 bath), check them out on our Available Rentals page! New listing prices were up 8.84% from September 2017. 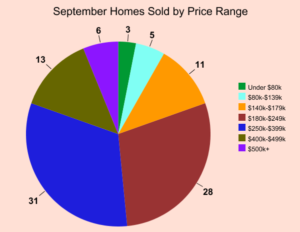 Average sold price was up as well, 7.73% from September 2017. Finally, average days on the market were down a remarkable 25% from September 2017. 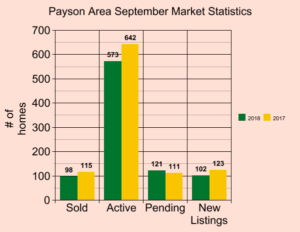 There were 98 total homes sold in the Payson area in September (down 14.8% from September 2017), 102 new homes listed for sale (down 17.1% from September 2017), 573 active homes for sale (down 10.7% from September 2017) and pending sales were up 9% from September 2017. 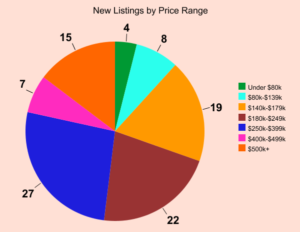 A break down by price shows what ranges are selling and what price ranges buyer’s are searching for. In summary, if you have had thoughts of renting or selling your home, now is a great time to make the move! Call us anytime to discuss the market and see how we can help you! – information is provided exclusively for consumers’ personal, non-commercial use, may not be used for any purpose other than to identify prospective properties consumers may be interested in purchasing, and the data is deemed reliable but is not guaranteed accurate by Central Arizona Board of Realtors and flexMLS.